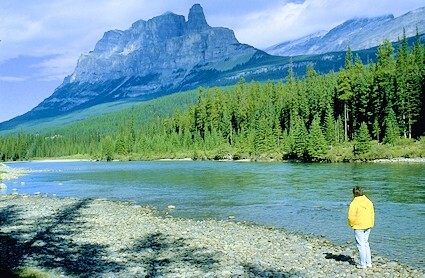 Surrounded and guarded by the Canadian Rockies is one of Canada’s most treasured sites . 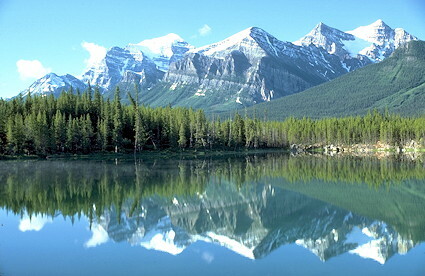 . . Banff National Park, which is part of a World Heritage Site. Banff, along with other Mountain parks is known internationally as an UNESCO World Heritage Site and is one of the world’s largest protected areas. This area attracts visitors from all corners of the globe and is one of the most majestic regions in Canada. Established in 1885, Banff, is Canada’s oldest National Park and came to being because of the hot springs. Shortly after the Europeans discovered the hot springs, a dispute arose as to their ownership, so the government stepped in. The Canadian Government proclaimed a 26-square kilometre area around the hot springs as a federal reserve. Within two years, more area was added and it became Rocky Mountain Park. The natural hot springs and spectacular mountain scenery quickly became a tourist destination, bringing in much needed money to the Canadian Pacific Railway. 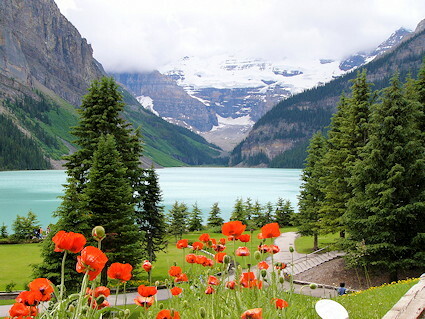 In 1902 Lake Louise and area was incorporated into the park area and in 1930 it officially became Banff National Park. The hot springs first brought the travellers to this region and they are still working their magic on young and old alike. Today, Banff attracts millions every year. Some come to enjoy the awesome sites while others come to take advantage of the many outdoor recreational opportunities. Covering an area of approximately 6,600-square kilometre (2,500 square miles) Banff and Lake Louise are the two main centres within the park boundaries offering the travellers amenities to make stays unforgettable. Banff National Park is a scenic wonderland of towering snow covered mountain peaks, deep rugged valleys, majestic glaciers and glacier fed lakes and streams. There are hot springs, an abundance of wildlife, hoodoos, water falls, and winding through out most of the park is the beautiful Bow River. Mother Nature’s creations are all around, towering throughout are incredible mountains, the most famous and recognizable include Cascade, Castle, and Rundle. It’s their majestic and unique formations that make them so unforgettable. Unmatched is the icy blue-green glacier formed and fed waters of Lake Louise and Moraine Lake. There are beautiful cascading waterfalls, hundreds of rushing streams that tumble down from the mountains and hoodoos. Lake Louise is breath taking. Surrounded by mountains the beautiful and calm water act as a reflection pool for Mt Victoria and Victoria Glacier (directly across the lake from the Chateau). Bright poppies that grow wild on the Chateau grounds make a lakeshore border of profuse colour. Chateau Lake Louise with over 500 rooms, convention facilities and interesting shopping is an attraction by itself. There is a number of hiking trails that lead from to the higher alpine meadows and mountain peaks. 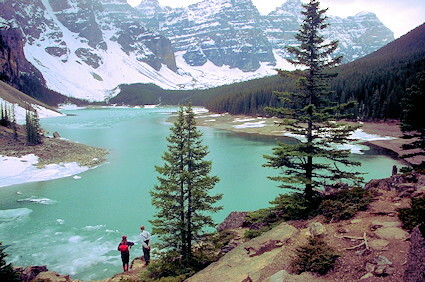 Moraine Lake situated in the Valley of Ten Peaks, unlike Lake Louise is surrounded by raw wilderness. Take the short self-guided interpretive trail that leads to the top of the moraine and spectacular views of the lake, valley and mountains. Situated in the Bow Valley with Mount Rundle and Cascade Mountain forming the backdrop, Banff is filled with exciting attractions including the famous Banff Springs Hotel. Visit the place where it all started, Cave & Basin National Historic Site. Enjoy the peace and quiet of the Cascade Gardens that are close to town centre. 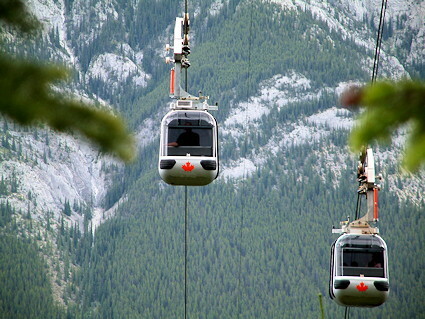 For a panoramic view of the town and area, ride the Sulphur Mountain Gondola. Treat yourself to a soak in the Upper Hot Springs. Enjoy bird watching along the Vermillion Lakes that makes a for a pleasant drive or walk. Enjoy fishing, horseback riding, biking, swimming and photography. There are interesting and exciting scenic drives, viewpoints and interpretive trails. Natives you might encounter are the grizzly bear, black bear, timber wolf, elk, moose, bighorn sheep and mountain goats. Please remember never feed the animals! The Canadian Rockies are world famous for their majestic scenery and the abundant wildlife they house. Welcome to one of the most beautiful places in Canada . . . welcome to Banff National Park, Alberta.